Learn how to make your own mosaic in the style of Gaudí. 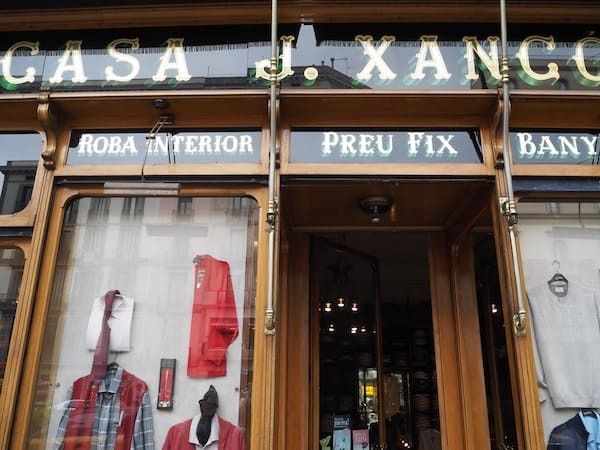 Explore the typical neighbourhoods of Barcelona through the eyes of a local fashionista. 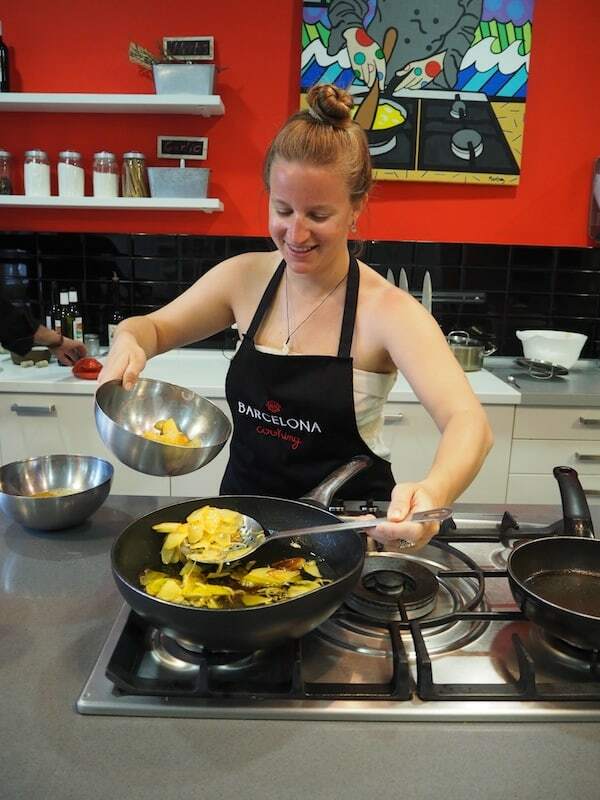 Cook your way through the city … As I am thinking about my creative stay in Barcelona, I can still taste the flavour of that succulent paella as well as feel the gentle warmth of that local smile the city has for us: Laure, a young Frenchwoman who now calls Barcelona home and offers to take us on a “fashion walk” around town. 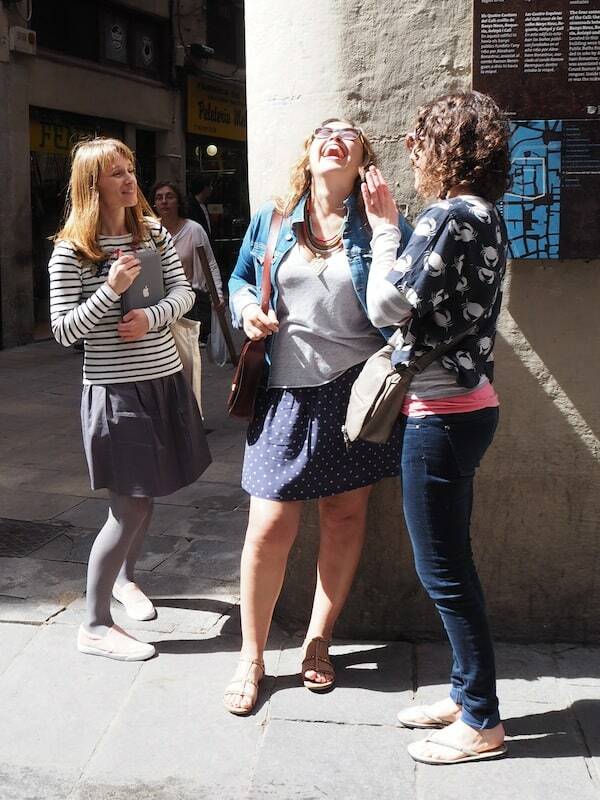 I smile back at her, thinking that this might very well be my sixth visit to Barcelona already. A city that has got so much to offer. 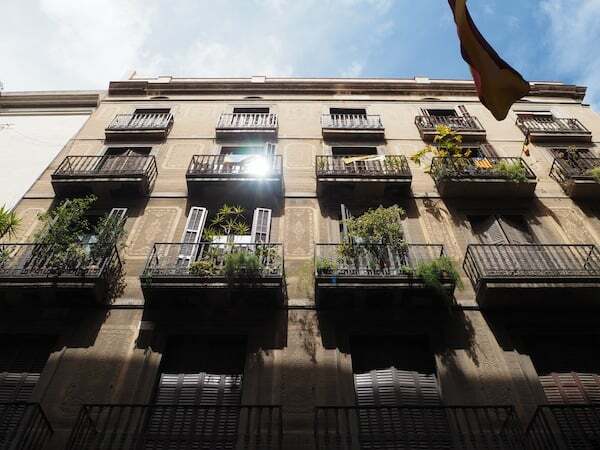 A city that is at the forefront of the international creative tourism movement, thanks to their 10-year anniversary of “Barcelona Creativa” Barcelona Creative Tourism initiative. Naturally, as “Creativelena”, I therefore had to come (again) and see for myself what is HOT & NEW in a creative world city such as Barcelona. Teach an old dog, i.e. 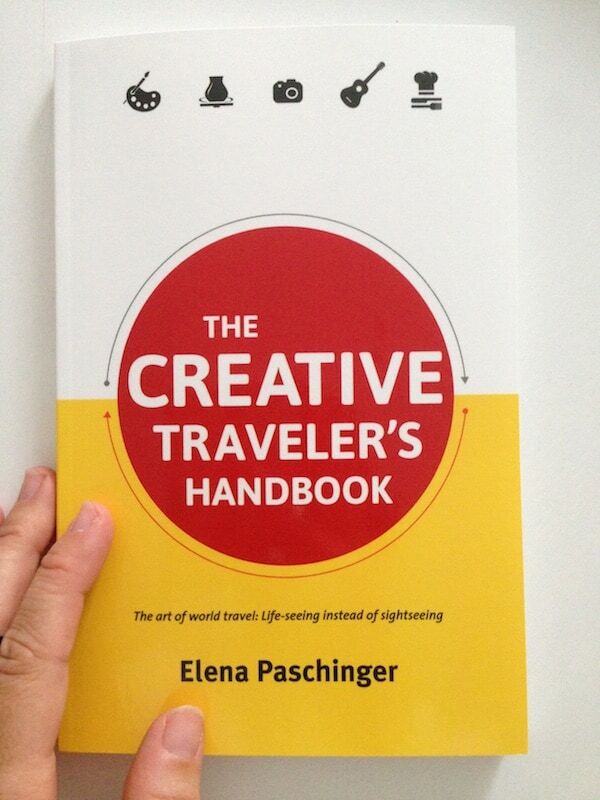 an experienced creative traveller, new tricks? Barcelona definitely has what it takes. 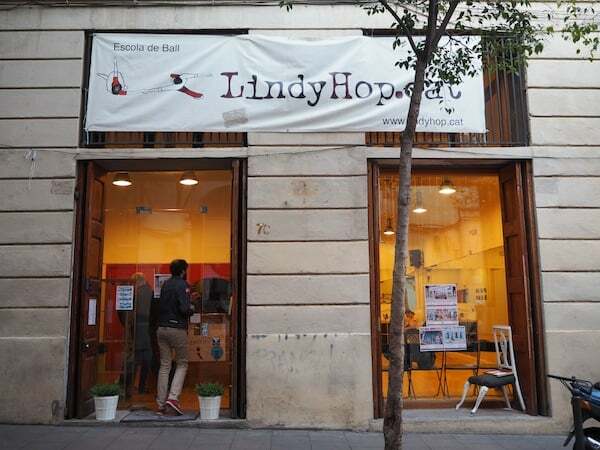 Fancy doing a Swing or Lindyhop Dance Class in the heart of Barcelona’s famous Gràcia district – or learning more about the art (fashion) history of the Catalan capital city? 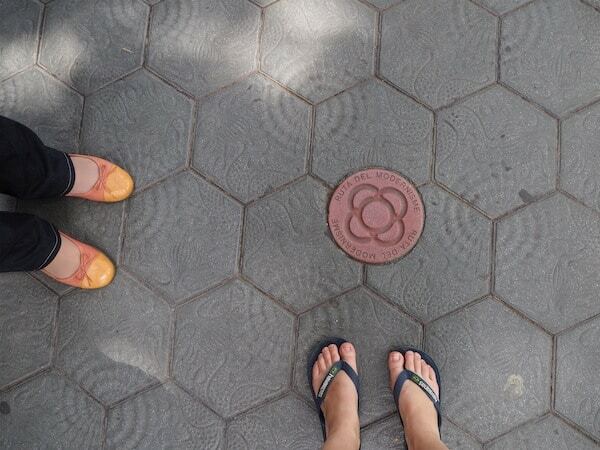 “Dancing” is something you can almost everywhere in beautiful, sunny Barcelona … Mind your step though: On Passeig de Gràcia, the city’s most famous promenade, all floor tiles are made from Gaudi designs! … and light. 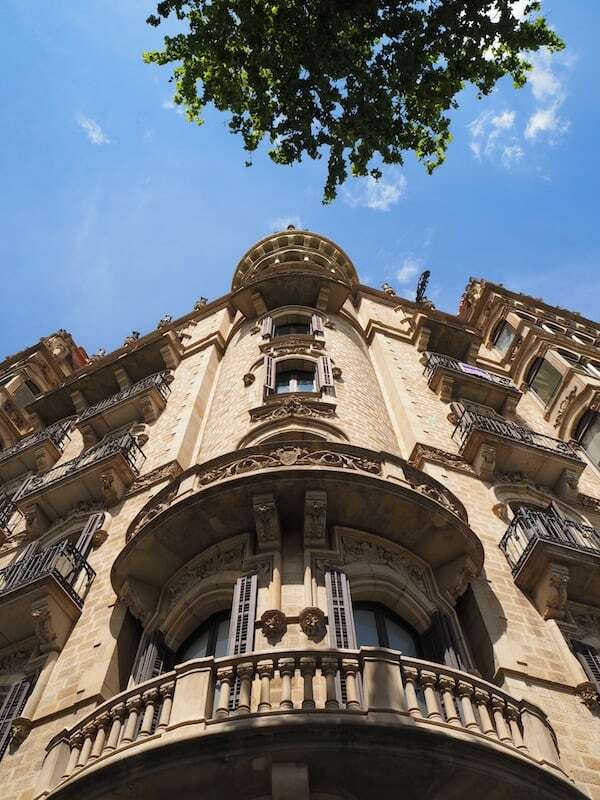 Don’t you, too, just love the look up the streets of Barcelona? The city’s architecture definitely invites you to do so – Look everywhere if you can! … and I like how her fashion walk around town ends in the “fashion” of sharing food together as new friends … thank you for such an interesting take on your new home, dear Laure! 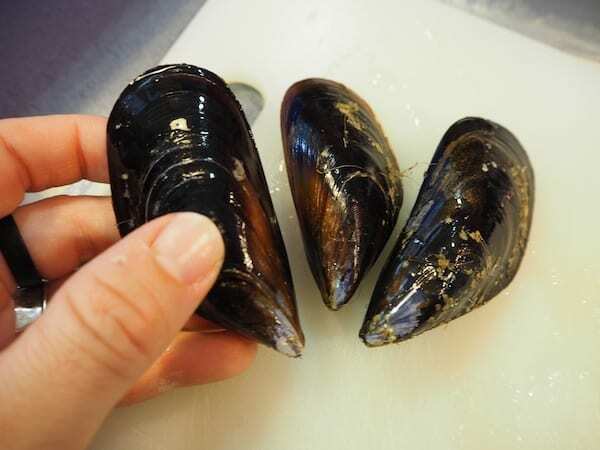 Mussels, however, are not just served as an appetizer or tapas at the local Barcelona bars. 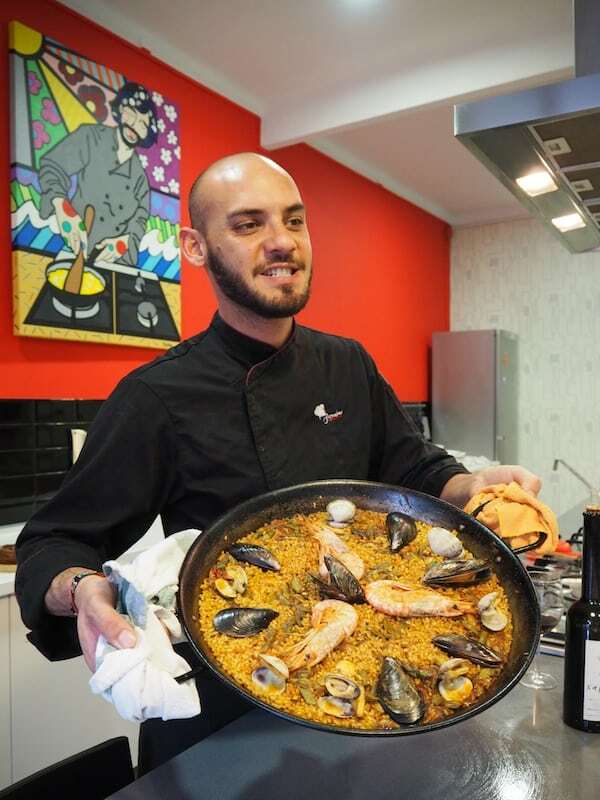 “Barcelona Cooking” teaches you how to properly prepare them dishing up your very own Paella in the process – one of the best I have ever made myself. “After all, it is YOUR LOVE & dedication that went into the preparation of this whole new dish!” Lalo smiles at us encouragingly, reflecting the growing pride & flushed cheeks of my two British cooking companions Joan & Karen who, like myself, first looked slightly intrigued at Lalo’s use of squid juices (!) 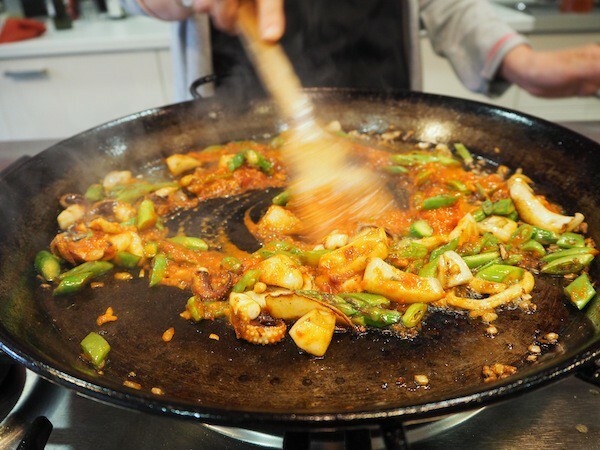 for lending our paella its distinctive, tangy flavours. 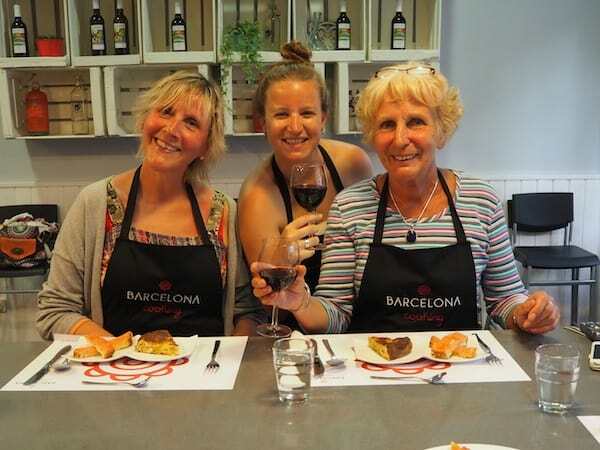 “We never knew we were able to prepare five different meals in less than two hours time – and all of them taste just marvellous!” Karen is visibly proud – and a little tipsy from the red wine we have been offered to cook with. 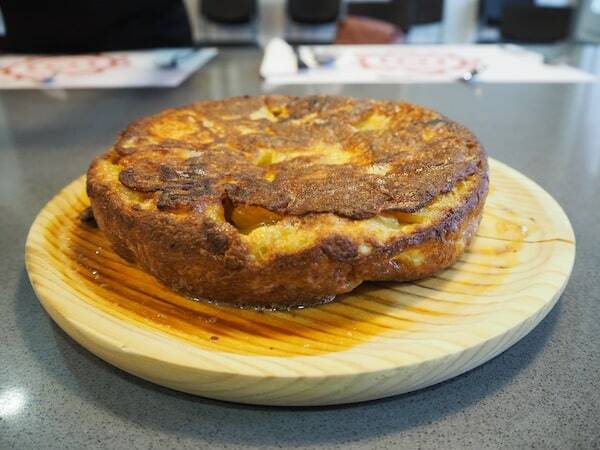 Together, the three of us are here to cook under the expert guidance of Lalo, himself a master chef who originally hails from Argentina and now, like Laure, calls Barcelona home. 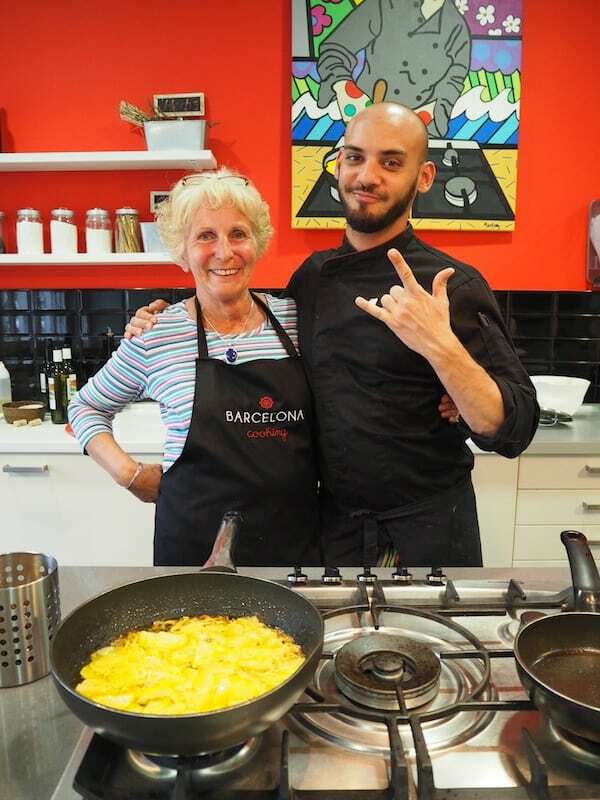 The same night of the evening cooking class, which takes place on the first floor of a building located right on the city’s famous “Las Ramblas” main street, we are emailed all details & recipes about our class, inviting us to fully focus on the cooking “at hand”. Distraction only comes to us by means of the great Rioja, perhaps. And Lalo’s encouraging smiles! … “Well done girls!”, is what Lalo our chef seems to say to us here! My pleasure to be cooking with you – a perfect way to make new like-minded friends while travelling.! 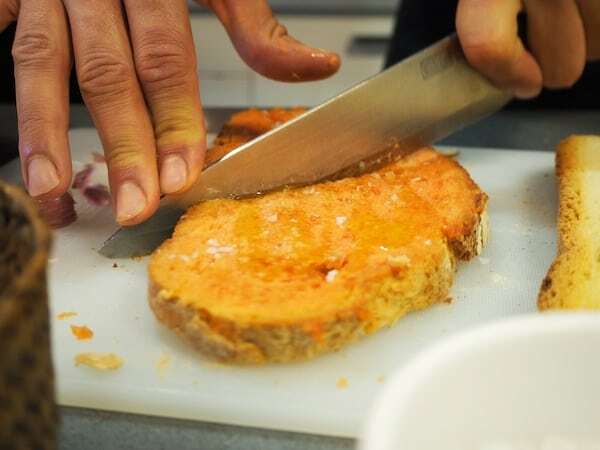 … while Karen & Joan are busy preparing our first set of starters: Heavenly bread with tomato, garlic & extra virgin olive oil. Proud of my perfectly flipped Tortilla creation with Barcelona Cooking !! 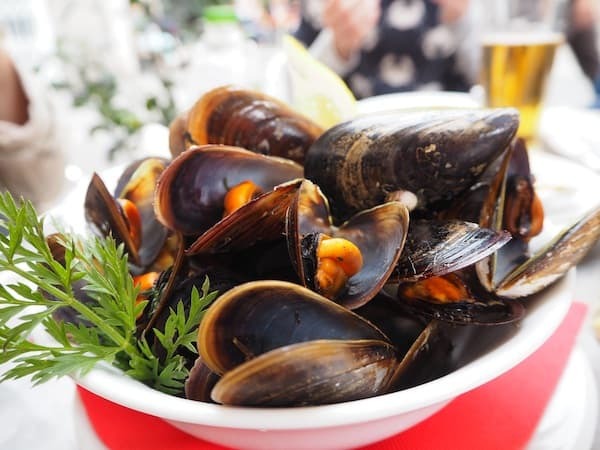 Fancy a bite there, dear readers? 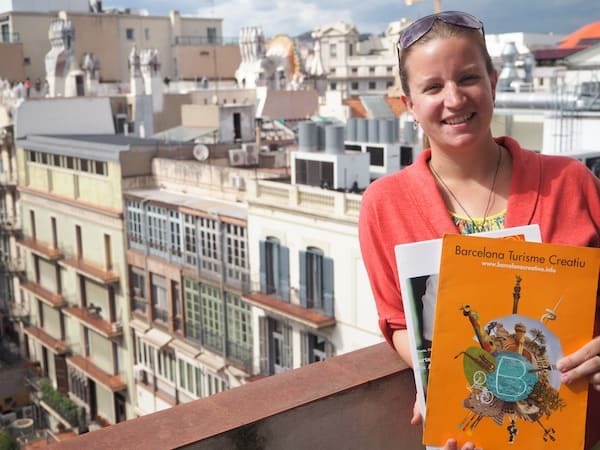 For even more “food love” & creative travel activities in the city of Barcelona, have a look at the Barcelona Creative Tourism website & current programme / schedule of events. I am sure there is more to suit your individual tastes & preferences! As for myself, I really have to come back soon (again) – not just for the dancing or the cooking, but also for who you meet along the way of creative travelling .. ! 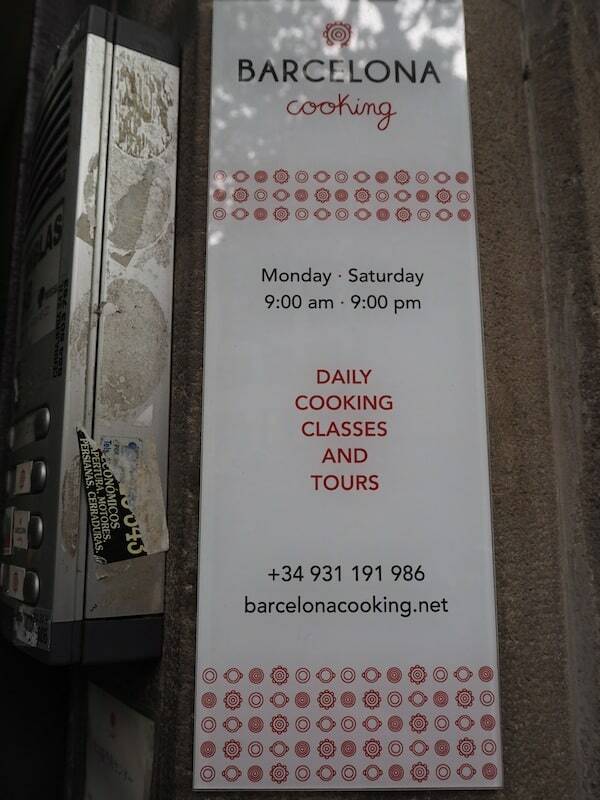 Disclaimer: Thank you Barcelona Cooking & Barcelona Creative Tourism for inviting us to sample several of Barcelona’s typical creative travel activities. All opinions are my own. 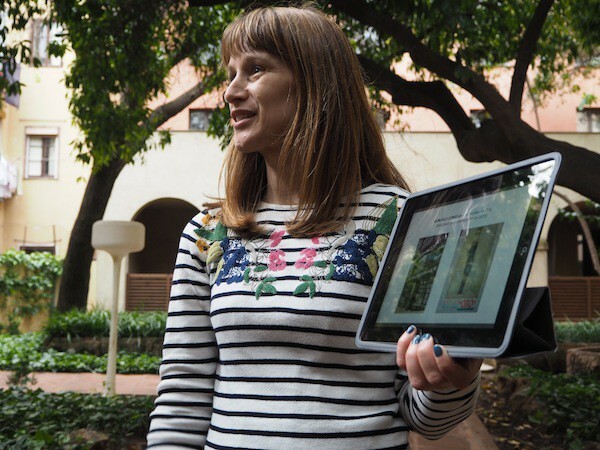 A Bike Tour, a Food Tour or a simple Walking Tour? Have all three while in Barcelona!